Earth, Fire, Air, Water – they have more power than you dream. Ever since her ex-boyfriend spread those lies about her, Becca Chandler is suddenly getting all the guys—all the ones she doesn’t want. Then she saves Chris Merrick from a beating in the school parking lot. Chris is different. Way different: he can control water—just like his brothers can control fire, wind, and earth. They’re powerful. Dangerous. Marked for death. 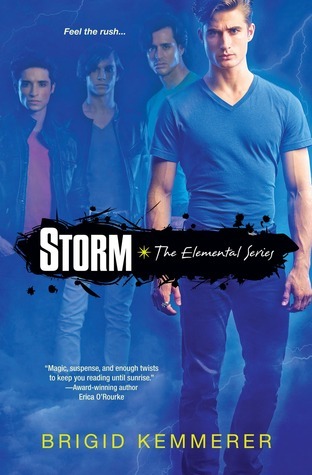 I read the prequel, Elemental, and wasn’t all that impressed with it, but I decided to read Storm anyways. I’m glad that I gave it a chance because I really enjoyed it. The story is told in 3rd person POV between Becca and Chris. I felt that both of these characters were well-developed and I really liked them. Though I always feel that 1rst person gives a better emotional connection to characters, I think that 3rd person worked well here and still gave me the connection that I look for. I loved the Merrick brothers. Michael, the oldest (and the focus of the prequel) is the guardian for his brothers and puts up with a lot of crap. He’s also trying to find the balance between parent and brother and is resented for it. I felt bad for him for most of the book, but got some hope at the end that they’ll all get along better with him. And even though I didn’t care for the prequel, without reading it I probably wouldn’t have liked Michael much in this book. I liked one twin and was annoyed by the other. Nick is the peacemaker in the family. He’s sweet and strong and I would’ve liked to have seen more from him. Gabriel is surly and impulsive. He also has that sarcastic bad boy thing going for him that’s usually reserved for the male leads in YA. I’m usually into that, but here he mostly annoyed me. He’s the one that really butted heads with Michael all the time and it got old after awhile. But as the book goes on we see that he’s not such a douche. And I believe that the next book is focused on him, so I’m hoping he stays a little nicer. Chris is probably my favorite of the Merricks, but that might just be because he was the most developed. He’s struggling with learning to control his element, water, and also with fitting in with his brothers. He grows up a lot throughout the story. He became more confident, but also remained sweet and protective. I really liked him and Becca together. Hunter, the “mysterious” new guy was a little clichéd. There was never a time when I didn’t think he knew way more than he let on or that he wasn’t using Becca in some way. He reminded me a lot of Blake from the Lux series, but better. Even though he lied a lot, I did mostly like him – and his dog. I also thought that Becca’s father was a little too predictable. Though there are still answers I want from him that we didn’t get – like what he did to Becca on the bridge and in the field. One thing I really could’ve used more of was explanation of the Elements. We know that they each have some power to manipulate an element (Michael – Earth; Nick – Air; Gabriel – Fire; Chris – Water; Hunter – Spirit – flashbacks to Vampire Academy, anyone? ), but not really the how. Chris talks about feeling the power of water and that it can lead him to danger, but I would’ve liked more explanation on how exactly it worked. Or a better description of it when they were using their power. I also don’t completely understand the Spirit element, but hopefully that will be explained more later. Overall, I enjoyed Storm. I loved the relationship between the Merrick the brothers and look forward to reading more of them. I would recommend this book to fans of YA with sci-fi elements (ha, see what I did there).